R & G Water Systems is a family-owned company operated by Rick and Georgina Roos. 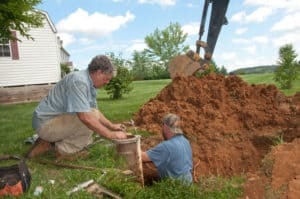 We have more than 45 years of experience in the water industry and are a licensed water conditioner and pump installer. Our company installs and services any make/model of well pumps and water treatment systems. We pride ourselves on offering high-quality services at a reasonable price. We understand the urgency when it comes to home water issues, which is why we offer a 24-hour emergency hotline for well problems. Call us in the middle of the night and you will talk to the owner! And even after our techs have helped you solve your water problem, we are still available for any follow-up calls and questions you might have. R & G Water Systems services the greater Baltimore metropolitan area, including Carroll, Baltimore, Howard, Montgomery, Anne Arundel and Harford counties, as well as the southern Pennsylvania counties of York, Adams and Lancaster.